All our products include free delivery at CDMX and San Miguel de Allende, Guanajuato. 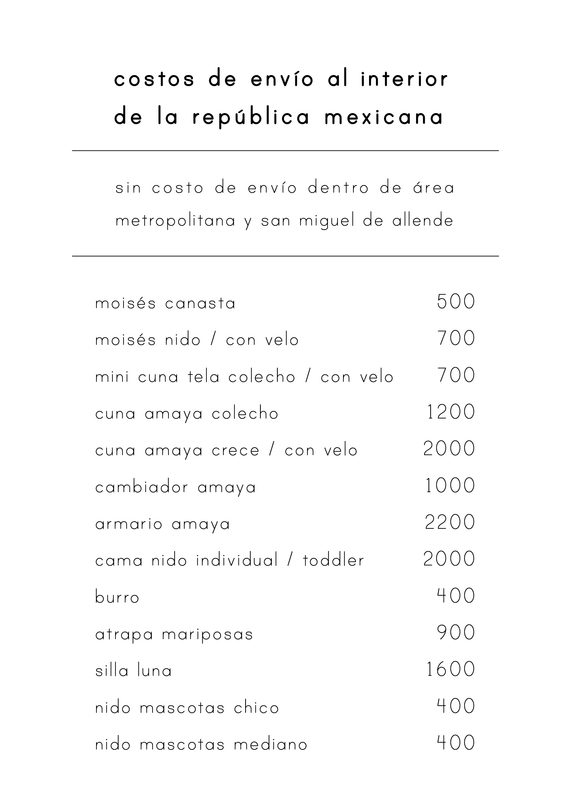 For shipments within the Republic of Mexico we handle fixed rates per product. The shipping cost will be displayed prior to finalizing the purchase process in our online store. Click here to review our shipping price table. International shipments are not enabled in the online store. However, if we make international shipments !, write us an email to hola@nidomuebles.com specifying the product of your interest, postal code and country to quote the shipment. What are the delivery times after the purchase in the online store? Delivery time is specified on each product. Generally we handle 15 days for products in stock and 4 to 6 weeks on parts that are made on request. Check the general information of the product of your interest the delivery time. What type of payments do you accept at the online store? Is there an extra charge for card payment? Do you accept credit card payments for monthly payments? If, when making the purchase online with credit card, you can choose 3 months without interest. How can I make a discount coupon valid? Within the online purchase process the system will request the discount coupon code before finalizing your purchase (enter it in case you have one). Much of the wood we use is certified and the finishes are 100% free of toxicity. The fibers used (like palm and wicker) are 100% natural. The fabrics are compositions of cotton and bamboo. Because the materials used are 100% natural small variations in shades can occur. What kind of mattresses do the products that include it use? We use mattresses made of firm foam and 3 cm of memory foam (so you can use it on both sides). Mattresses include a 75% cotton / 25% polyester washable cover. How complicated is it to assemble furniture? The assembly of our furniture is very simple, do not forget to use the instructions inside each piece. We will also send together with the furniture, the necessary key for the assembly (in the pieces that so require). Where can I see the furniture physically? Our store is located in San Miguel de Allende, you can also find our products in friendly stores in CDMX and in the interior of the Republic. Visit the contact section to find the nearest one. Is there any chance that my order will be delayed? We do our best to meet all orders on time and in full. We maintain a direct communication with our clients so that, in case of a delay, we notify them in a timely manner and confirm the new delivery date. The pieces of furniture have a 3-month warranty for manufacturing defects, furniture nest will evaluate if a complete change of the part, component or repair is made on site, we will ask for images of what you consider requires a repair or change to evaluate the situation . In case the defect arises after 3 months Nest furniture reserves the right to review the piece of furniture and determine next steps, we will ask for images of what you consider requires a repair or change to evaluate the situation. Is it possible to cancel a purchase online? It is possible to cancel a purchase online provided they have not been fulfilled 24 hours after the purchase. Write an email to hola@nidomuebles.com to cancel. Can I customize my piece of furniture in another finish? Yes, of course you can !, just write an email to hola@nidomuebles.com telling us what you need and we can both personalize the finish and make custom furniture. Can you design my baby's room or spaces for children? Yes and we love it! We can take care of the design of your baby’s room, space for children, teens and other projects (playrooms, nurseries, schools). Write to hola@nidomuebles.com to start designing your nest together!